The North facing corries of the South Cluanie Ridge are a fine sight from the A87 in Glen Shiel. Many of the corries have some great looking lines on show, and there are a few hidden away from view as well. However, the eye is naturally drawn to the pyramid of Sgùrr an Lochain towards the Western end of the ridge, and the fine looking East face. Offering a superb descent off of a pointy summit, it doesn't get much better than this! The best starting point is from the layby at NG044114, where a stalkers path crosses the watershed. Follow this for a few hundred metres, taking the right branch before leaving it, and making your way West, crossing the Allt Coire a' Chùil Droma Bhig and the Allt Coire a' Chùil Droma Mhòir. You then have a choice of heading round the spur and into Coire an Lochain (looks like a reasonable way in just above the 700m contour), or ascending Sgùrr an Doire Leathain. There's not much of a drop between the 2 peaks, and this approach gives you a great view of the face, as well as getting you up on the ridge quickly, so it is recommended. There are several other chutes descending the ridge between Sgùrr and Lochain and the Bealach Sgùrr an Lochain that look enjoyable. The big North face of Sgùrr and Lochain has a long shallow line that looks worth the trek back to the road for. If you are looking to shorten your walk out, and get a gentler ski, the East facing corrie of Sgùrr an Doire Leathain into Coire a' Chùil Droma Mòr gives a pleasant descent. The East face of Sgùrr and Lochain is a beautiful 1000ft vertical slope descending directly from the summit. On the skiers right hand side of it, is a shallow gully line, known as "Right Gully". In all but the leanest of snow cover, this gully is indistinguishable from the rest of the face. It holds snow well, and catches the morning sun, making is a good choice in bright, but lean, firm conditions. From the summit, trend right on easy ground towards the rollover, where the rest of the face drops below you. In the context of this website, the angle isn't very steep - think Summit Gully on Aonach Mor, for example. This line isn't about the angle though, and is completely about the position and location. There are other shorter options possible dropping off the NE ridge, including a short narrow chute just before the obvious rock band that opens up onto the face. Notes: Easy for the grade. Flying Gully takes a diagonal line through the cliffs on the skiers right of the East face, and is more of a ramp line than a gully. Steeper than the main face, it also has reasonable risk associated with it due to the ever present cliffs on the skiers left. It's not to be confused with the short and very steep chute that joins the snowfield of the East Face about half way down. 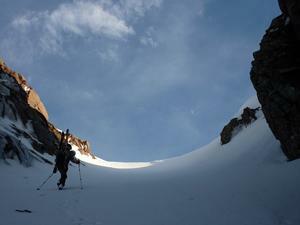 The easiest angled entrance is skiers left, where there is less chance of a cornice. However, it feels very exposed due to the cliffs. Not a place for a mistake. Once in, the angle is more amenable in the mid-section before a narrow steepening on the right to exit. The line is short, but requires care. NOTE: When I attempted this in mid-March 2015, snow in the shade was pretty solid. The top of the line caught the morning and early afternoon sun, so was nice and soft, but two-thirds of the way down, I (somewhat predictably) encountered white concrete. Due to the fact that below me were cliffs, and the exit was steep and narrow, I switched to crampons and downclimbed the last section. I've included it here as it's definitely do-able (in the right snow conditions! ), despite my failure on it. Notes: Steep at top and bottom, and very exposed.